In the preceding pages, we have briefly introduced you to the many facets of oriental rugs from the tying of the very first knot to the many ways in which the final product can enhance the beauty of any interior, be it residential or commercial. Having absorbed this information, you should now be able to purchase your oriental carpet with greater knowledge, understanding, and confidence. Buy from an established retailer of oriental rugs with a trusted reputation earned through serving the community. Buy from an establishment whose integrity can be verified through recognized trade associations, or check with your local Better Business Bureau. Avoid traveling auctions, often held at hotels and airports. They may be here today and gone tomorrow. You should protect yourself by being able to deal with someone on an ongoing basis. Beware of "Going-Out-Of-Business" sales which may be promotional schemes, where values are exaggerated and the quality of the merchandise is mediocre or below average. Also, once out of business there is no one to turn to. Once you have found a carpet that appeals to you, feel free to question the oriental rug retailer about its quality and suitability for the area you have in mind to use the rug. In fact, you should not buy a carpet until you have thoroughly inspected the actual piece or a representative sample for its quality, color, and design. Above all else, you should feel totally comfortable with your selection. 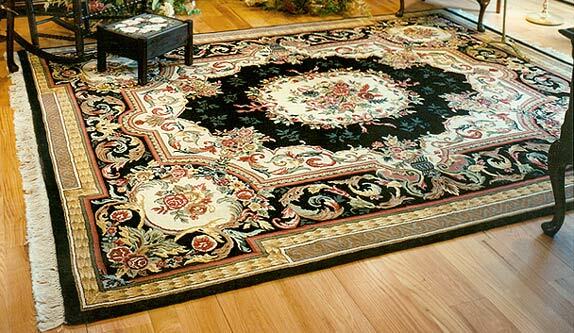 A handmade oriental rug will add a unique blend of excitement, mystique, and charm to your home or office. Equally important, it is an authentic work of art to be treasured not only during your lifetime but also in that of generations to come. On a room to room basis, determine how you use your room, the look and feel you want to create, and a budget per rug. 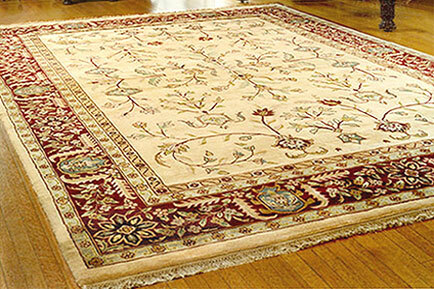 There is a wide variety of rugs from which to choose at many price points. It is recommended that fabric(s) and wall-coverings be selected after you have made your rug choice. Room layout will limit rug dimensions. Carefully note the maximum length and width in feet and inches that corresponds to the ideal (or exact) rug size for that specific location - then either select a rug size that comes closest to, but does not exceed, that measurement, or have a custom-size rug made for that area. There are no hard and fast rules about on or off the edges. Generally speaking, though, form should follow function (as ever) - and aesthetics are in the mind of the beholder. Consideration should be given to the amount of traffic and soil to which the rug will be exposed. Handmade Knotted Pile - Traditionally hand woven with wool (or silk) and secured to a cotton foundation by knotting (vs. gluing) - thereby a rug of superior quality is produced. Factors that may affect or increase value: density of pile (knots per square inch) and intricacy of the design motif. Handmade Flatweave - The most distinguishing characteristic of the flat woven rug is that it doesn't have any pile. Usually made from wool, cotton, bamboo or other materials, these rugs are reversible. Hand Tufted - Comparable in both look and feel to a hand knotted rug but more economical to produce - using a process whereby the back is glued with latex (rather than knotted) to hold the hooked fibers in place. The surface loop pile is then sheared to produce a flat, smooth pile. Hand Hooked - With a hooked rug, the loops of yarn are left intact, forming a characteristically knobby pile, as opposed to the smooth surface pile of the tufted version, which uses an otherwise identical process. Value of a handmade textiles as a unique piece of art. Rugs can be used as wall hangings, made into pillows, or used as tabletop coverings. Handmade Oriental Rugs, with proper care and maintenance, will last for generations. Area rugs are a portable asset (can be easily transported to a new location). The inherent value of precious commodities (e.g. metals, artworks, quality handmade rugs) serve as a hedge against inflation. If you are purchasing 2 or more rugs the following chart may be useful. Click here to print. Bringing swatches (fabric, wall-covering) and/or color chips when shopping for a rug can eliminate unnecessary guesswork.